Financial education saves you time and money. Which is why I'd always encourage TheWiseLiving readers to sign up for as much Pinoy financial seminars they can so they can increase their knowledge and connect with like-minded people! 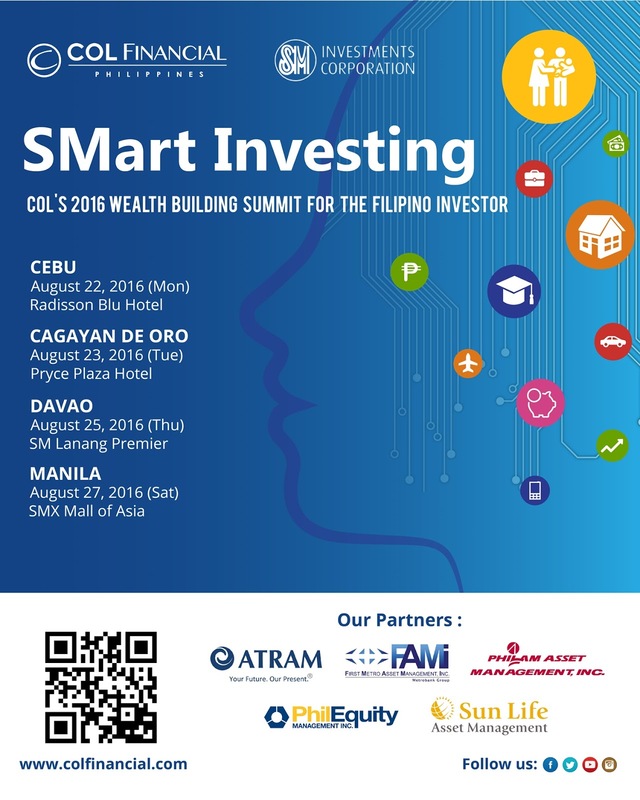 It's a good thing that COL Financial, my personal online stockbroker of choice, is holding a free summit for interested Pinoy investors: SMart Investing: COL’s 2016 Wealth Building Summit for the Filipino Investor. By joining this free summit, Filipinos can increase their financial literacy and find out what it takes to invest your way into financial security and independence. Learn about stock market investing in the Philippines and discover how to grow your portfolio by investing in mutual funds. Hear from an impressive team of financial experts, including COL Financial Chairman and Founder Edward Lee, Philippine Stock Exchange President and CEO Hans Sicat, COL Fund Expert Marvin Fausto, and the top fund houses of the Philippines: ATR Asset Management, First Metro Asset Management, Philam Asset Management, PhilEquity Management, and Sun Life Management. Participants will also be able to sit in on COL’s mid-year market briefing in the afternoon session, spearheaded by COL Head of Research April Lee Tan and COL Chief Technical Analyst Juan Barredo. In addition, each day’s activities will come to a close with a panel discussion with investment experts and representatives from SM Investments, BDO, and SM Prime, followed by an exclusive Q&A session. SMart Investing will kickstart this journey towards financial literacy on August 22 in Cebu, at the Radisson Blu Hotel from 8:30 am to 5:00 pm. The summit continues on August 23 at Cagayan de Oro for a 12:00 pm afternoon session at the Pryce Plaza Hotel. The last two days of the summit will be in Davao on August 25 at SM Lanang Premier, and in Manila on August 27 at SMX Mall of Asia, from 8:30am to 5:00pm on both days. For more information on this event, visit the official Facebook page of COL Financial (https://www.facebook.com/colfinancial) or register for the event at http://bit.ly/COLsmartinvesting.